Many patients from NYC with a wide nostril, bulbous nasal tip often complain about their nose looking too big at the end. Wide nostrils width can sometimes create or contribute to the appearance of an oversized nose that doesn’t fit the face especially for patients with an ethnic descent. Dr. Philip Miller specializes in wide nostril nose surgery for his patients in NYC. The ideal nose creates a triangle shape with symmetrical nostrils that are of a proportionate size. When nostrils are too wide or large, it draws attention away from the eyes and face and disproportionate emphasis is placed on the nostrils. Whether owing to ethnic heritage or genetic makeup, a nose that has big or large nostrils is a frequent complaint of many potential rhinoplasty patients. Dr. Miller performs nose jobs to address overly wide or large nostrils in his NYC office for a variety of ethnic patients. To reduce nostril size, he removes portions of the surrounding tissue through incisions either below or inside the nose. This results in minimal to no obvious scarring. Reducing the size of large nostrils can give your appearance a totally new look. Whether you want subtle or distinctive changes, a new nostril shape can be the foundation for a new you. Perhaps it isn’t just your large nostrils that have you bothered. Maybe your nose is causing you breathing difficulties or other health problems. A nose job can improve both appearance and functionality, allowing you to enjoy each day free from restrictions caused by nasal irregularities. Obviously, if you are dissatisfied with your appearance because of nostrils that you find too large for your face, you are a potential candidate for a wide nostril/big nostril nose job. The ideal wide nostril nose job candidates are non-smokers, in good general health and at least 16 years of age. The age requirement reflects the reality that nose jobs should not be performed on noses that are still in the formative stages. Noses reach full growth in girls between the ages of 13-14 and boys between 15-16. The first step in determining your candidacy for a wide nostril/big nostril nose job is to set up a consultation with Dr. Miller. You can learn more about wide nostril rhinoplasty, including reduction of wide or big nostrils in NYC, by contacting us to set up your consultation with Dr. Miller. You can call us at (646) 791-3112 or complete the convenient Contact Form, and one of our Patient Administrators will be happy to get you started on the road to a new and improved you. 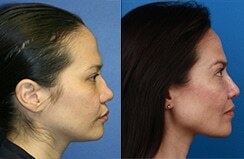 Visit Our GalleryNext, learn about rhinoplasty.